I was privileged to spend time recently with Garr Reynolds, author of Presentation Zen and really my Sensei (Teacher) in starting my journey in all things presentation. His books are compulsory reading for anyone keen to improve their presentations and contain simple ideas and wisdom that have transformed many presentations and presenters across the world. 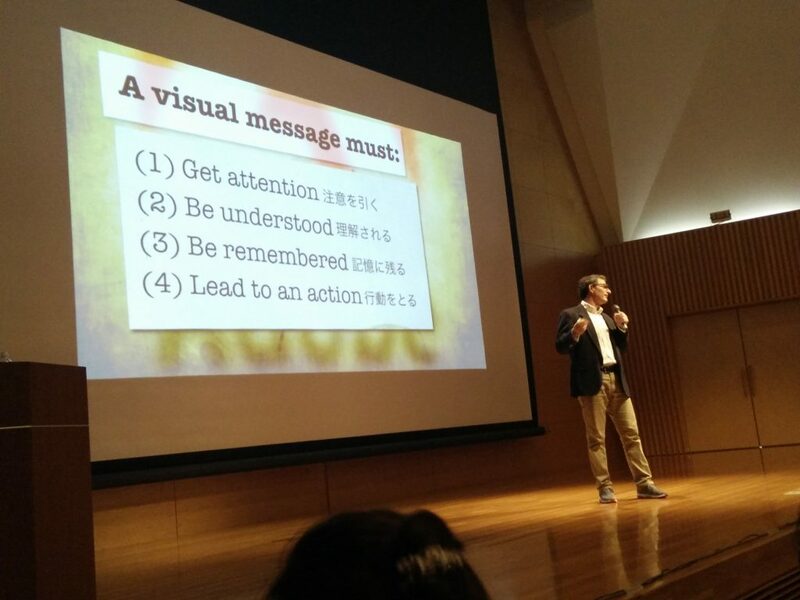 It was enlightening watching him deliver a presentation at Okayama University. I hope to share some of that with you, the first lesson being about an effective visual message. 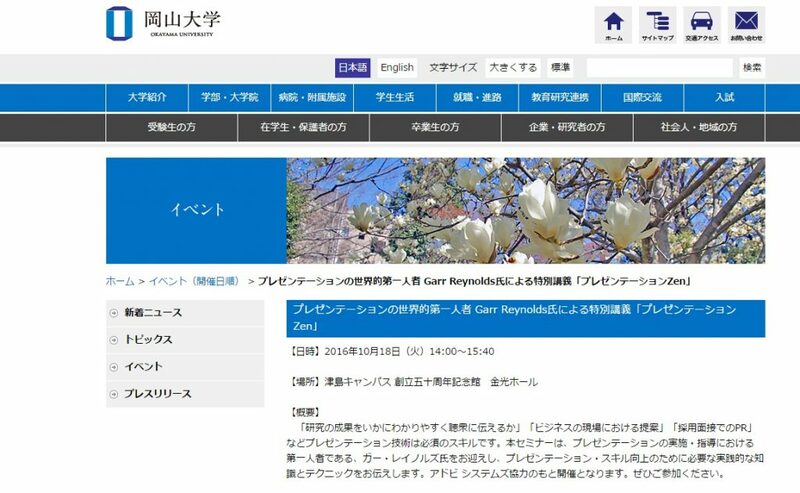 The website at Okayama University advertised the event as below. Is this an effective visual message? Accepting of course that that is a web page it highlights the challenges of designing an effective visual message. It is not simply enough to place text or data in an image. Not only will the message be lost but it will lead to distraction from the speaker and the essential message being delivered there. There is more to a visual than simply its presence. There are four simple rules for an effective message, and by extraction, for every single slide in p2. A slide needs to get attention.This is by design and content, not the intrinsic requirement to read text. This is where design rules and creativity play a part but such skills are within the grasp of any good presenter. A visual message must get attention or risk being distracting from the overall message. A visual message must be understood, easily and quickly. This applies equally to images and data. If the audience struggle to understand their attention will be drawn from the verbal message. Context, cropping, design skills and verbal explanation may help. Addition of further text is unlikely to help. The Glass Slipper defines a movie. It is memorable and allows the story to be re-constructed from that single image. A visual image in a presentation is not simply decoration but a valuable part of the presentation that should aid retention of the overall message. Ideally a visual image should lead to action. That action may be deeper understanding, questioning, reflection, challenge or simply reaction, the choice is that of the presenter. A visual image must have a purpose and if that purpose doesn’t lead to an action, its value is likely to be purely decoration. The visual message of the initial webpage is pleasant but doesn’t grab one’s attention. The message, unless you are able to read Japanese is lost. The image itself is not memorable and although it may stimulate one to look away, this is not a desireable action. Consider each of these four points for every slide in p2. Sometimes when I work on my P2 I have a tendency to over-elaborate and look for an image for each key point. I get so enamoured with choosing just the image that it takes over. I’ve found that by leaving the talk, focusing on rehearsal and P3, I then go back and delete slides and have better delivery. As you say a good talk is the product of P1 x P2 x P3. Andy, totally agree. A very helpful point that practise allows improvement not only by repetition but suggesting edits. You are correct that there is a temptation to illustrate, rather than annotate, every single point. That needs to be addressed.